I’m pleased to let you know that the collating of LABYRINTH SUBLIME is almost complete. 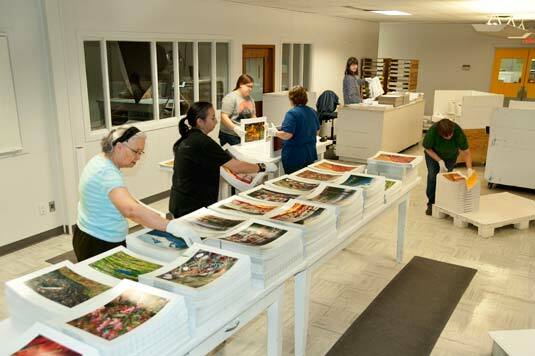 As you may have guessed, collating is being done by hand. And we’ve had some good laughs, which I’ll share along with photos below. Weight being a factor, the bindery women decided to gather LABYRINTH SUBLIME in thirds of about 120 pages each. They walk around the table collecting sections while holding the growing book block on one arm. On the side table they jog the pages neatly, and then place the completed “third” on pallets. 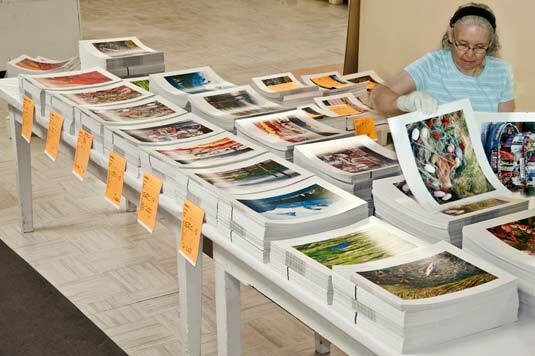 Here’s a photo to visually describe the collating process. I’m standing at my inspection station in the background. 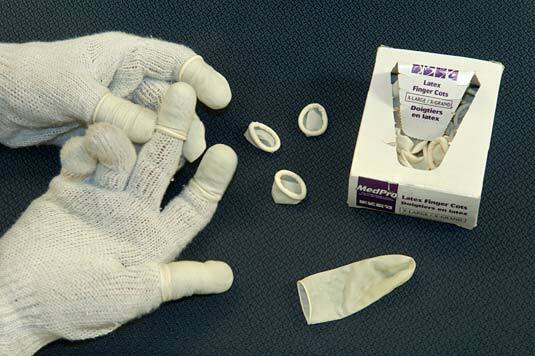 From our experience with ANTARCTICA, we knew the best way to handle the slippery pages without leaving fingerprints or creating dents, is to wear white cotton gloves tipped with thin latex finger cots for grip. Cots have many medical applications and thus are available through pharmacies. In industry, they should be in every first aid kit, in case a severed finger tip needs be kept in place. Artists and crafters use cots to protect fingers from paint and glue, or to hold sewing needles more securely etc. Surprisingly, Friesens’ bindery staff were unfamiliar with finger cots. Rave reviews from the women with whom I shared a few (brought from Salt Spring to wear during my inspections) lead management to source a local supply. This was not without a little good natured reluctance on the part of the manager (a man) to head to Altona’s pharmacy with samples of what appears to be “rubbers” hoping to purchase a large supply — something he’d only do for his bindery women. To give perspective, Altona is a Mennonite town of just 4000 people, where everyone knows one another, and many are related through blood or marriage. The obvious similarity to condoms led to a fair bit of double-talk and outright joking. I need not elaborate, but you can imagine the comments, especially as we all needed X-Large so as to fit over the gloves, and as the older women needed demonstrations as to how to put on their cots. My work now is quite exacting. Following a week of preliminary inspections and a few meetings, I am now in a daily routine from 8:00 am through 6:00 p.m. personally checking every page of every book, square inch by square inch, focussing on the minutia. I’ll write more about this another day. I thought to close this email by sharing with you two amazing quilts from Friesens’ impressive Canadian art collection. Hand-sewn by local Mennonite women, these quilts honour Friesens’ most-printed authors and their books. Have a look below... here’s Harry Potter on his broom! 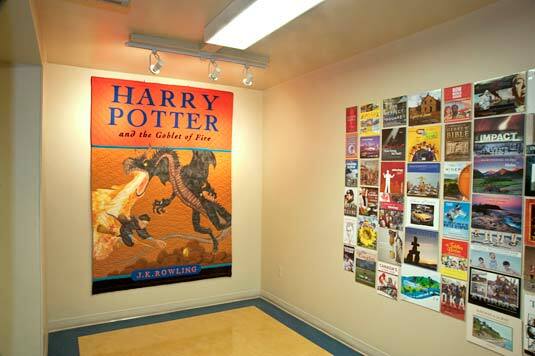 Friesens printed well over a million copies of the first five volumes in the Harry Potter Series. In 2000, the initial press run alone for Harry Potter and the Goblet of Fire was 400,000. 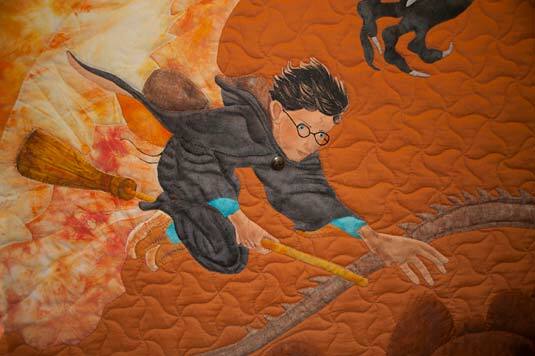 The J.K. Rowling quilt is appropriately queen-size. 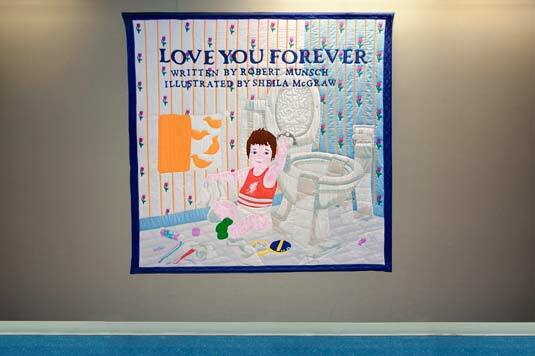 Robert Munsch has made Canadian publishing history with Love you Forever. Friesens has printed over 20 million copies of this classic children’s book. True to the illustration by Sheila McGraw, the endearing little boy on the quilt is about to drop his mom’s silver wrist-watch into the toilet. Snow banks are receding here in Altona, Manitoba; however, fresh snow is forecasted for later this week. It’s a long winter — not only here but elsewhere across the continent.